Most of the speech was boilerplate. 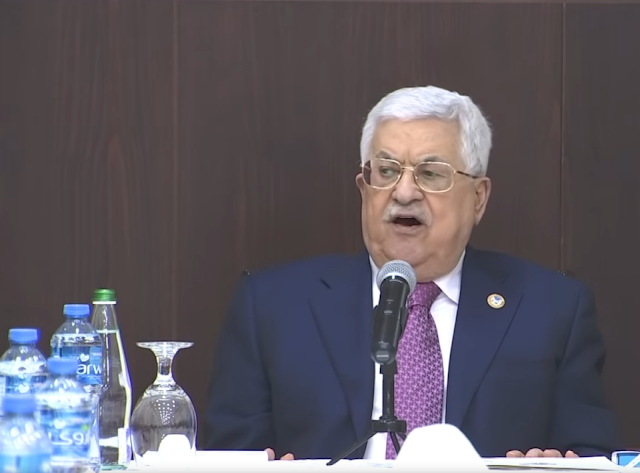 Abbas stressed that they will not accept any tax money from Israel as long as Israel deducts the salaries they pay terrorists, which he called a "red line." Abbas said that that they will never accept a state that doesn't include Jerusalem or the 1967 "borders" that never existed. Abbas claimed that the 12 year split between Hamas and Fatah is all Hamas' fault, and so forth. Most importantly, he bragged about his intransigence and refusal to compromise one bit for peace, saying "We will not retract one word in the resolutions of the national councils since 1988 until today." That means that Abbas has refused to change one bit from Yasir Arafat's position throughout his entire leadership. It also means that the PLO didn't make any meaningful concessions throughout the entire Oslo process. He has said this numerous times before. Western media ignores not only Abbas' intransigence, but his glee over not being willing to compromise one iota for peace and relying, today, on terrorist Yasir Arafat's red lines. Women wherever they are must take their rights. We must support them and develop their presence. Women are no less than men. They do not lack anything to be minister and president anywhere in Palestine. Here is what the cabinet looks like: 20 men, 3 women. One of the women is the women's affairs minister. The others are the tourism and the health minister. The hypocrisy of his statement is of course not mentioned in Palestinian Arab media. I am intrigued by the water bottle with the green cap next to Abbas. 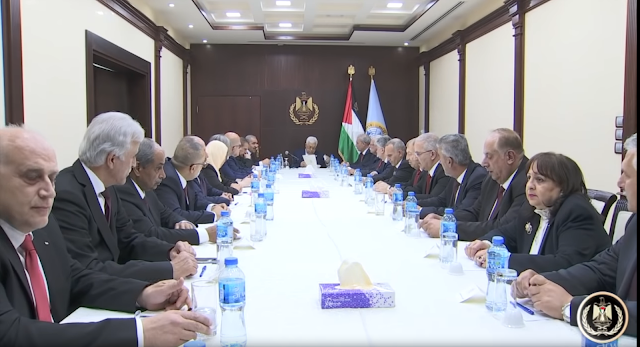 A few years ago the government was embarrassed when it was shown they were drinking Israeli water at their meetings, and since then they switched to an Arab brand which can be seen on the table. But at one point in his speech, someone poured Abbas some water from this other bottle - a bottle with no label on it. Is he drinking water from an Israeli company that they removed the label from to avoid embarrassment?